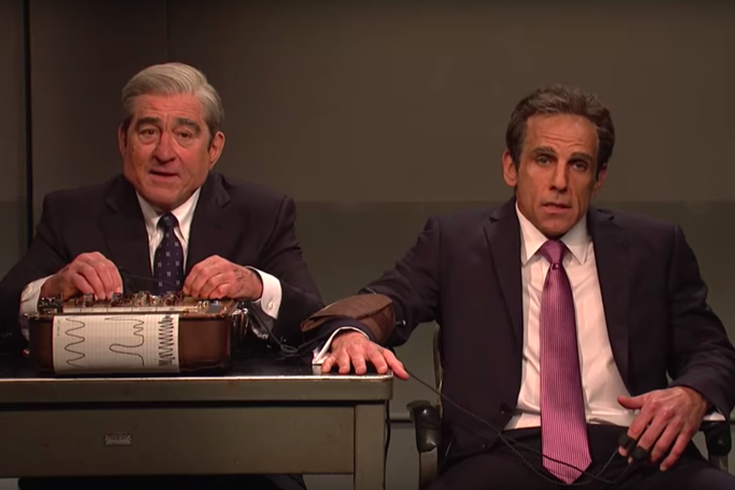 Ben Stiller plays Donald Trump's attorney Michael Cohen, while Robert De Niro makes an appearance as Special Counsel Robert Mueller in a parody of the lie detector scene from "Meet the Parents." Mulaney is a drag queen waitress who has a personal vendetta against one of his customers. Never order lobster in a diner, or else things might get musical. A Hollywood producer explains his disastrous sitcom that focused on a very taboo plotline. A man explains to his girlfriend his decision to have his horns removed. A student can't participate in a school protest over gun violence because of a very specific problem. Watch a promo for a reality television show that's only about the introductions. For more from "SNL," click here.